Tap the power of shamanic healing to live a more joyful, authentic, and healthier life. know when to call on a shamanic healer by understanding how they work. Sometimes we may lose touch with an essential soul quality or ability such as confidence, the ability to feel emotions, or self-love. We may have energetic or spiritual baggage holding us back from fully living and achieving our dreams. Laureen, a master storyteller, shares her wealth of experience on how you can use shamanic concepts and techniques to heal yourself using empowering stories of how ordinary people have, with ease, tapped the endless possibilities available for healing and enriching our lives. Soul Drops and Soul Sprays are also available to support you in using the exercises on this CD to bring more soulfulness to your life. How Often Would I Need Shamanic Healing? What if Someone Else Has Part of My Soul? What if I Have Part of Someone Else’s Soul? 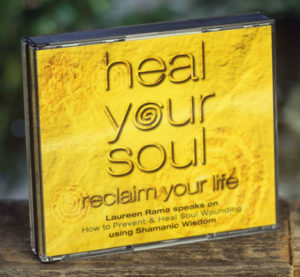 Note from Laureen: I am no longer doing shamanic healing sessions. Contact Jeff Stockton at www.jeffstockton.ca and let him know you found out about him here!